1959. Pierre Cardin moves to Paris in 1945 and works at the fashion house of Paquin and with Elsa Schiaparelli. The following year he is commissioned to design the costumes for Jean Cocteau’s fabulous movie, La Belle et la Bête. Impressed with his work, Cocteau introduces him to Christian Dior, who makes him head of one of his studios. In 1950 Pierre Cardin sets up on his own, putting himself in the spotlight by designing about 30 of the costumes for “the party of the century”, a masquerade ball hosted by Carlos de Beistegui at Palazzo Labia in Venice on 3 September 1951. 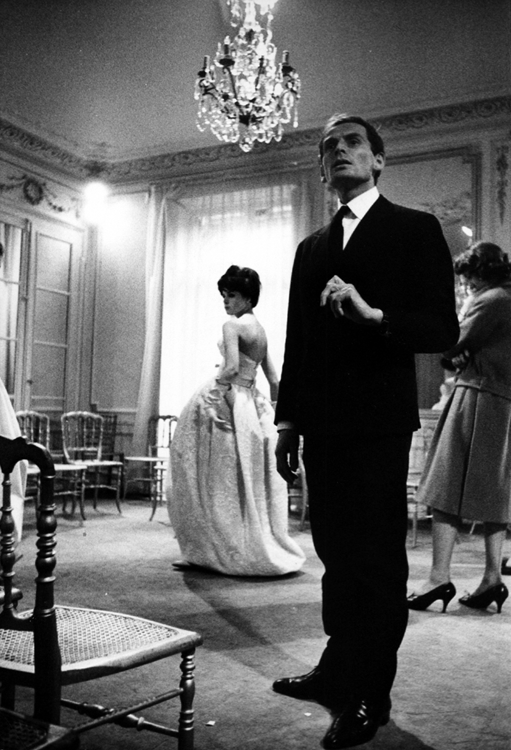 In 1953 he launches his first haute couture collection. The following year he opens his first women’s boutique, Eve, and introduces the “bubble dress” – a loose-fitting gown tightened near the waistline and at the hem to create a “bubble” effect. In 1959, he is the first couturier to turn to Japan as a high-fashion market, and during the 1960s he will become known for his avant-garde style, Space Age designs and geometric shapes and motifs. He will also pioneer designer branding, licensing his name and making a feature of his logo on his creations.